• The ability to deliver a 150J shock (recommended adult energy level) within 5 seconds – using the same Philips tried and tested SMART biphasic therapy as our premium HeartStart family of defi brillators. • The ability to be used on both adult and infant/child patients for defi brillation, monitoring, synchronized cardioversion or pacing. It even has a single paddle set for adult or infant/child patients, so care providers have no extra checks to know they have the right equipment. • A Patient Category Button which allows clinicians to quickly switch between patient categories, automatically changing parameter limits, analyzing rhythms and prompting the user to deliver a shock, if appropriate. 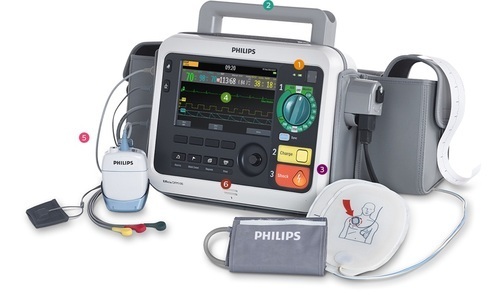 • An optional AED mode (including infant/ child AED capability) that uses Philips SMART Analysis algorithm to guide basic life support providers through delivering defi brillation, with the quick and easy 1-2-3 operation pioneered by Philips, and used on all Philips AEDs.